Hello Everyone! Guess what? 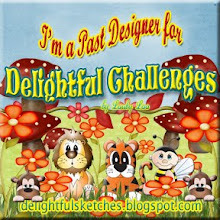 I am one of the newest DT Members of Designs on Cloud 9. 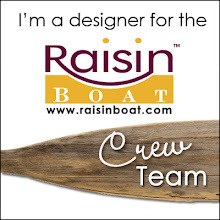 I am so super stoked to be on this team. As you all know, my sister gave me a Silhouette Portrait for Christmas and it was love at first sight! I am really happy that I have the opportunity to play with my machine and use these super cute cut files. My card is an easel card featuring Spring Birdhouses. 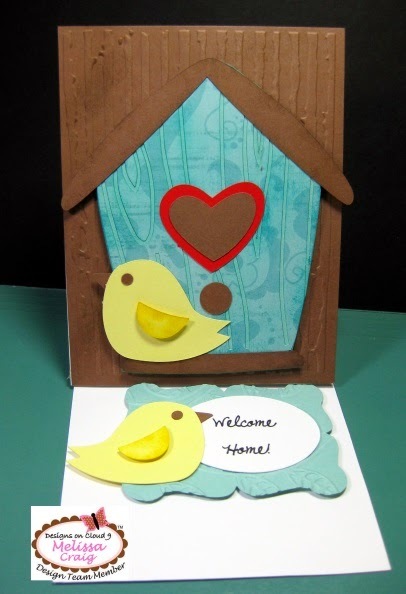 I enlarged the birdhouse shape quite a bit so it nearly created the entire front of A2 sized card. I cut the little bird out twice. My only regret, I should've used the other little bird in the set rather than the same one. But all in all, it's a perfect "Welcome Home" card to give someone who maybe just moved or perhaps has returned home after an extended stay away. 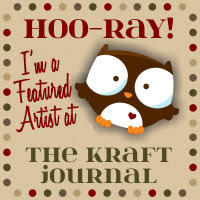 My card also features a label from Artisan Labels. I created the greeting on my computer and printed it out on card stock and then cut out using an oval cutter. 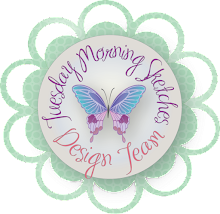 I hope you enjoy my easel card and don't forget to pick up this week's freebie! Happy Friday! I really love how cute this turned out. Those birds are a pretty yellow that just add a pretty pop! Super Cute!